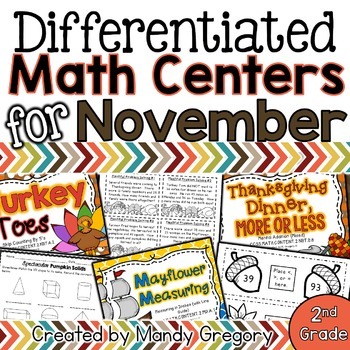 Looking for Differentiated Math Centers for November? This pack was created to support independent activities for the math block. This pack contains eleven different activities, nine of which are differentiated. However, counted individually, this pack has twenty-four activities. Teachers can use the skills to differentiate for students by difficulty level, or can have students complete all levels of the task, so the centers last for several weeks and scaffold upon themselves. The centers could also be used for differentiation in guided math groups. All activities include a recording sheet for student accountability. All centers are in black and white to save printing costs, but color OR black and white versions of cover sheets and directions are included. Please note that some activities require additional materials such as rulers. Turkey Toes- Students match the cards with pictures of identical feet and then put the cards in numerical order. Finally, students skip count to find the missing number. There are four versions of this game: skip counting by 2’s, 5’s, 10’s and a mixed skip counting by 2’s, 5’s and 10’s. Even and Odd Clodhoppers- There are two versions of this game. In the first version, students draw a card and sort it into even or odd. In the second version, students draw a card with an addition or subtraction sentence to 20 and then sort by the answer. Pilgrim Place Value- Students draw a card and solve the mixed place value review question on the card. Questions include expanded form, word form, standard form, value of a digit, and base ten blocks. There are two versions of this game. The first version requires a lower depth of knowledge of place value and number sense. The second version requires a higher depth of knowledge of place value and number sense by including the mental ability of regrouping numbers and blocks. Thanksgiving Dinner, More or Less- Students draw a card and answer the mental addition problem. There are three versions of this activity: 10 more or less, 100 more or less, and mixed 10 and 100 more or less. Cornucopia of Comparing- Students draw a card and solve the comparing problem with <,>, or =. There are three versions of this activity: comparing two digit numbers, comparing three digit numbers, and comparing two and three digit numbers. Plucky Addition- Students draw a card and solve the addition problem within 100 using the place value strategy. This is NOT a differentiated activity. Plentiful Problem Solving- Students complete addition word problems within 100. There are three different versions included: adding without regrouping, adding with regrouping, and adding with and without regrouping. Mayflower Measuring- Students draw a card and measure the object to the nearest inch. There are two versions of this activity: objects with a guideline to help with measuring and objects without a guideline. Spectacular Pumpkin Solids- Students match a card with an image of a solid geometric shape to the name. There are two versions of this activity. In the first version, students match pictures of the geometric solid shape. In the second version , students match pictures of real world objects that are the geometric solid shape. 2D Pumpkin Shapes- Students match a card with an image of a plane geometric shape to the name. There are two versions of the recording sheet. One includes a bonus question asking students to identify all the quadrilaterals on the page. Pumpkin Shapes Sort- Students sort pictures of geometric shapes into the categories 2D or 3D shapes. This activity is NOT differentiated. Center Icons for Rotations or Bin Labels-These are square labels that match each of the centers’ cover sheets. These are perfect for center rotations or for labeling bins. Center/ Work Stations Menu or Cover Sheet-I created this sheet for students to check off as they complete the center/work station each day. They can also be used as a daily or weekly reflection piece for students. Students Reflection Rubric-At the end of the week, students have a simple rubric to complete that allows them to reflect on their effort and understanding. Simple Grading Sheet-This is a simple sheet for teachers to staple to the top of all of one student’s centers. There is a checklist of all the centers and teachers can score all of the centers for one student. There are four check lists to a sheet. Teacher Check Sheet-Editable checklist to mark off if students have turned in all the centers in this pack. CCSS.MATH.CONTENT.2.OA.B.2-Fluently add and subtract within 20 using mental strategies.2 By end of Grade 2, know from memory all sums of two one-digit numbers. CCSS.MATH.CONTENT.2.OA.C.3- Determine whether a group of objects (up to 20) has an odd or even number of members, e.g., by pairing objects or counting them by 2s; write an equation to express an even number as a sum of two equal addends. CCSS.MATH.CONTENT.2.NBT.A.2-Count within 1000; skip-count by 5s, 10s, and 100s. CCSS.MATH.CONTENT.2.NBT.A.3-Read and write numbers to 1000 using base-ten numerals, number names, and expanded form. CCSS.MATH.CONTENT.2.NBT.A.4- Compare two three-digit numbers based on meanings of the hundreds, tens, and ones digits, using >, =, and < symbols to record the results of comparisons. CCSS.MATH.CONTENT.2.NBT.B.5-Fluently add and subtract within 100 using strategies based on place value, properties of operations, and/or the relationship between addition and subtraction. CCSS.MATH.CONTENT.2.NBT.B.7-Add and subtract within 1000, using concrete models or drawings and strategies based on place value, properties of operations, and/or the relationship between addition and subtraction; relate the strategy to a written method. Understand that in adding or subtracting three-digit numbers, one adds or subtracts hundreds and hundreds, tens and tens, ones and ones; and sometimes it is necessary to compose or decompose tens or hundreds. CCSS.MATH.CONTENT.2.NBT.B.8- Mentally add 10 or 100 to a given number 100-900, and mentally subtract 10 or 100 from a given number 100-900. CCSS.MATH.CONTENT.2.MD.A.1- Measure the length of an object by selecting and using appropriate tools such as rulers, yardsticks, meter sticks, and measuring tapes. CCSS.MATH.CONTENT.2.G.A.1- Recognize and draw shapes having specified attributes, such as a given number of angles or a given number of equal faces.1 Identify triangles, quadrilaterals, pentagons, hexagons, and cubes. 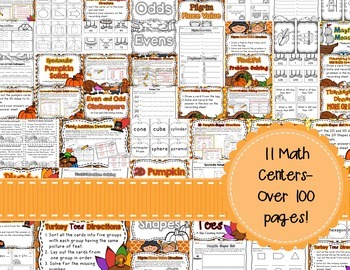 I also have differentiated Math Centers for available for other months and seasons! Want them ALL? Save money by purchasing as a bundle! !